Town attacker Kazenga LuaLua insists there is no reason his side can't leave Oakwell with their fourth successive victory in all competitions this afternoon. 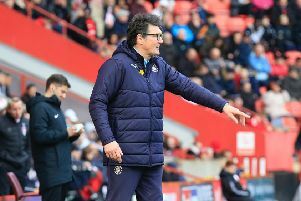 The recent addition played a starring role as Luton beat MK Dons in the Checkatrade Trophy in midweek, following on from league successes against Oxford United and Scunthorpe. Facing a Tykes' side buoyed by their 4-0 win over Peterborough last weekend, LuaLua said: "It’s massive game, when you win games it’s makes a lot difference. "There’s a positive sign and before the game, the manager said we’ve got two massive games, tonight and Saturady, so it’s a big week for us. "We have another tough game away to Barnsley on Saturday as we’re confident, we're in good form. “Its a big game as I think Barnsley are one of the favourites to go up, we're in good form, we're doing well. "We’ve won the last three games, and they have as well, so it;s not going to be an easy game, but why not go there and try to get three points?" Although LuaLua would love to start, he has had to make do with a place on the bench, but wasn't letting it frustrate him as he returns to full fitness. He continued: "It's not just me, every player wants to play. "The most important thing is it’s a team game, the team comes first, it's not a selfish game for me, never has and never will. "For me its about getting minutes, but to make yourself be available when the manager needs you. "It’s step by step, I’m getting fitter and fitter, so it’s a team game, I’ m happy to be here with my team-mates, I'm enjoying it so far." On how his new signing is adapting, boss Nathan Jones added: "We've just got to get him up to speed, as he was a few weeks behind. "If we had our way he'd have been in a month earlier which would mean he'd be right up to speed now and flying, but he's really getting there. "He hasn't hit full tilt yet, but he's not far off. It was good to get the minutes as that he's only thing he’s lacked, and he’s a little bit closer to where he needs to be."